The blog has been Hindi film-centric for some time now, and it was never my intention to have it be so. The time has come to remedy the error of my ways and review some films whose stories are just begging to be told. Some are movies I had watched more than a decade ago; some are new-ish ones. They are in all different languages as can be, and deal with different cultures, different people - yet their stories are universal. One thing that unites these next few reviews is that they are, without fail, thought-provoking. The first of these is a film I watched recently, one that brings back memories of a time when it was not possible to remain untouched by events around us. It was the seventies; Emergency had been declared, and the Naxal movement was featured prominently in the news. Depending upon the sympathies of the newspaper, the stories were slanted to portray the Naxals as misunderstood Robin Hoods, or as the perpetrators of some of the worst crimes in the history of mankind. The truth, as all truths, lay somewhere in between. The late sixties saw the spread of the Naxalite movement from Bengal to Kerala. Conditions in the Wynad were particularly ripe for the rise of such a movement. Forest land had been depleted for cultivation, such land was owned by feudal landlords who bought up all the land and ruled over those domains with an iron fist. They exploited the labourers, charging them for the privilege of cultivating this land, and took their women as matter of right. The Naxalites claimed that they were fighting for the people against exploitative landlords, the brutality of the police, and the might of the state; and that, the only people who were attacked and killed, were the ones whom the law could not, or would not, touch. The 'Naxal menace', or so it was termed by the government, was so acute that the police were ordered to crack down with immediate effect. They did, violently, often cruelly, and very often, paying off old grudges in the process. The period between 1968 and 1977 was one of the bloodiest in the history of modern Kerala. Innocents died along with the guilty when the Naxalites bombed or otherwise attacked police stations in the rural areas. Many people were picked up by the police for 'questioning' and labelled 'Naxalite' - there was no one to question them. Neither side could claim to be totally 'right', though depending on one's sympathies, one is predisposed to defend one over the other. Talappavu (Headgear) brings back to mind the worst of the excesses of the period; yet, for all that it deals with a period mired in blood and gore, it is very understated, very 'quiet' as it seeks to unravel one particular incident, and its long lasting consequences. Somewhere in Wynad, an informer helps the police track down a young revolutionary leader. Caught unawares, he is captured, tortured, and finally ordered killed. Constable Ravindra Pillai (Lal) is chosen to kill him, and when he refuses, is forced at gunpoint by his superior officer. Joseph Verghese's (Prithviraj) calm demeanour intensifies his grief at having to kill the man whom he has been proud to call his friend. But old sins cast long shadows. Thirty five years have passed, and Pillai is a shadow of his former self. Bent under the weight of guilt and repentance, he finally confesses, telling the truth of what really happened that fateful morning years ago. Guilt had turned him into an alcoholic; he could not even confide in his beloved wife, so scared was he of his Superior's threats. His wife could not understand, or accept, the drastic change in her husband's behaviour until a 'chance' encounter with her husband's colleagues gave her the reason. (Or so she thinks.) It devastated her completely. Multiple flashbacks show us vignettes from Pillai's life. His happy days at home, his frustration at having been transferred to Wynad, away from his wife and children, his reminiscences about his childhood love, they paint a picture of a man who is not cut out to be a police officer, especially in those harsh times. It is on his way to Wynad that he first meets Joseph. The latter is quiet, but compelling as he stands up for an old woman's right to travel by that bus, and slightly contemptuous as he realises that Pillai is a policeman. If the law cannot help ordinary people, then what is it there for? For Pillai, the youth is someone he aspires to be, and knows he cannot. However, he is drawn to him. Later that night, there is an attack on the police station. There are no casualties, but one of the constables is wounded. Cowering behind the file cupboard, Pillai realises with shock that the attack is led by his charismatic friend from the bus. The latter recognises him, and his contempt for Pillai's fear passes fleetingly across his face. The next morning, the local landlord Saivar (Atul Kulkarni) berates the police for not being able to handle the 'Naxal' menace. He offers his men, money, backing - Joseph and his friends must be quelled. As Pillai turns to leave, he recognises one of the servants - it is his childhood sweetheart, Saramma (Dhanya Mary Verghese). His colleague informs him that she, like the others in Saivar's household, serves to 'take care of' Saivar and his cronies. Pillai visits Saramma the next day, and learns that her husband committed suicide within a month of her marriage. When she hides him from the eyes of passers-by (and hence from Saivar's spies), he is taken aback to realise that Joseph and his partners are hiding in the backroom. Saramma and Joseph take Pillai to their hideout in the forests. There, Joseph describes why he and the others have turned Naxals. These young men and women have given up their lives of comfort to help the weaker sections of society. In that cause, they see no reason to give any quarter and are willing to live and die for their beliefs. Joseph also reveals the unpalatable truth behind the 'suicide' of Saramma's husband, and the life she is forced to lead afterwards. Pillai finds himself sympathising more and more with the Naxalites. Then the unexpected happens. Things come to a head. Saramma, accused of harbouring Joseph, has been 'interrogated' but refuses to say anything; Joseph is betrayed and is in police custody, and Pillai finds himself at the cross-roads of right and wrong, duty and conscience. Thalappavu is a story of choices. Are 'law' and 'justice' one and the same? How do you address the conflict between the two? When the lust for power conflicts with the rights of an individual, then who is to stand for the meek and the oppressed? Isn't it the law? And if that very law bows before the power of the mighty, then who can the weak turn to? Are we to look away, and wait for the state to do the right thing? Do we, as individuals, not have a responsibility to the society at large? The narrative unspools from the perspective of Ravindran Pillai, who, tormented by his part in cold-blooded murder, finally breaks down and reveals that the 'encounter' that ended the life of a young revolutionary was staged. Joseph Verghese is a young man fighting for a cause; when the state machinery aids the exploiter and helps suppress the exploited, he takes the law into his own hands. When Pillai is forced by threats and intimidation to hide the secret of Joseph's murder, his nearest and dearest are estranged from him, and three decades of hiding the truth under duress costs him dear. Finally, it is the murdered Joseph who becomes the voice of his conscience, exhorting him to break his silence. For those who suffer injustice without raising their voice against it are as guilty as those who perpetrate the injustice. With sharply etched characters, it is Lal's constable Ravindran Pillai, who is forced to obey his superior officer, and whose life unravels in the aftermath of that horrifying deed, who stays with you after the movie is over. His pain-filled eyes are mute testimony to the pricking of his conscience, and he turns in a performance that is all the more powerful for being so underplayed. He deservedly won the Kerala State award for Best Actor that year. It is his film throughout, and he does not stumble even once. He plays the role of a devoted husband, doting father, principled but spineless police constable, moving between one and the other without striking a single false note. Prithviraj, playing Joseph Verghese, the charismatic Naxal leader who gives his life for the cause, can count this film as yet another feather in his crown. He has consistently chosen powerful roles, not caring whether he is the protagonist, or whether he gets adequate screen time. Here, his role supplements and complements Lal's, and the young actor delivers a strong performance without resorting to chest-thumping or loudly delivered rhetoric. It is his sincerity that makes you believe the cause he is espousing. It is a triumph for an actor who has been eschewing the trappings of stardom for the more rewarding path of character-driven roles ever since his debut. Others, known and unknown, complement the two protagonists. Atul Kulkarni is as efficient as always, playing Saivar, the landlord who treats the adivasis as pawns, with nonchalant ease. Rohini is good as Karthyayani, Pillai's wife, and one wishes she had other strong(er) roles to sink her teeth into. She is too fine an actress to be neglected. The actress who appeared in a cameo as Pillai's daughter also did a fine job. The other female protagonist is played by Dhanya Mary Verghese. As Saramma, she moves effortlessly from a girl in her mid-teens, to a woman in her late twenties. Like Lal, she uses her eyes to great effect, and her final scene haunts you long after the movie is over. I would like to see more of her. Last but not the least, a note about the debutant director, who very deservedly walked away with all the state awards that year. After donning many hats as a successful writer and actor (winning many awards in both roles), his debut venture is a dark subject that is engrossing from beginning to end. Despite its non-linear narrative, he has a tight hold on its telling, each segment looping back to the earlier scene, thereby heightening the effect. He handles his subject and his characters like a veteran, leaving things unsaid (and un-shown), the implications more, dare I say, satisfying, than if he had crossed very t and dotted every i. There is no suspense in the film. It begins with the death of the central character, and slips into a flashback soon after. There are no comic side-plots to divert your attention, or violence or romance to interfere with the narrative. It is just 'real'. In a film that is 'tragic' from beginning to end, one would think that dramatics would have full rein. It is to the director's (and the screenplay's) credit that the scenes are so controlled that one feels its profound impact without actually realising it. I do wish that certain scenes (like the one where Karthyayani attempts to immolate herself) were better handled, and that the whole segment with Jagathy Sreekumar was removed. In retrospect, I have also wondered why Pillai couldn't unburden himself to a loving wife who had shown herself to be nothing but supportive, but that is a minor peeve. This sounds SO gripping. I have to admit that I generally shy away from these 'realistic' portrayals of crime etc - possibly because the reality was very close to my life when I was growing up? My father was a police officer, and posted in the Chambal area when the dacoits were at their zenith. Dinner table conversation between my parents often used to consist of what the dacoits had done in so-and-so place, which police informer had given what information, etc - and, invariably, about encounters. It used to be scary, too, because Papa had to often go deep into the ravines after the dacoits, and we were always scared that he wouldn't return... that's one reason why (unlike a lot of cinema bloggers) I don't like daaku films. But this one sounds very different, so when and if I get the time, I'll certainly look out for it! Your review makes me want to see the movie, but then again, do I want to see such an intense movie? I do remember the Naxal struggle, since my father was in Calcutta at the time, and he was getting threats all the time. Maybe I will watch this movie when I am sitting by myself in India. You should, Lalitha, and then you can tell me how you liked it. 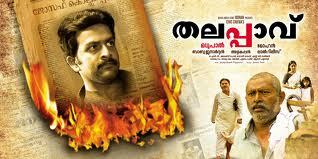 It is not without reason Malayalam cinema counts to be among the finest, what Indian cinema has to offer. I always liked the Malayalam films shown on TV. Good to see that new film-makers carry the tradition ahead! As for the film, what to say? Haunting! Thalappavu made quite an impact when it released and was noticed widely and finally established Madhupal as a film-maker to be reckoned, after so many years in the industry. His latest movie 'Ozhimuri' has been making waves among the critics' circuit but sadly, with very little publicity, it hardly made any impact at the box office. As you said, it is less about the Naxal movement but a more personal reflection of an honest but spineless constable caught in the war. Does the State have a greater right to take lives in the name of the law? Interestingly, Mohanlal's 'Shikaar' uses a similar plot line with the backdrop of the Naxal movement in Andhra but more as a thriller than an emotional drama. If you take the 1st half out of 'Shikaar', you will like the movie.Lal, as an actor, has featured in much better movies than as a director - thanks to Jayaraj for introducing him. Prithviraj has done interesting roles but the last year has also seen a lot of mucked up star roles, which hopefully, will be an exception than a norm. Atul Kulkarni as Saivar? Not very comfortable with artists dubbing for non-Malayalee artists and making it look so obvious - remember the menacing Bhaskar Pattelar, played brilliantly by Mammootty, in Vidheyan? Meh, I keep away from Mohanlal/ Dileep/ Jairam movies these days. Lal is a superb actor. I have always liked him ever since Kaliyattam and Kanmadam. Atul Kulkarni, I think, dubbed for himself. I think the muri-Malayalam was deliberate - he is supposed to be a Manglorean or something, no? I had a friend whose parents spoke Malayalam with that accent. I hope Prithviraj sticks to the unusual choices; I'm not very enamoured of him doing the same senseless roles. I tend to just ignore those films. Yup, I was going to write and ask you if you were alive. Did Atul Kulkarni dub for himself? Don't remember but still tad uncomfortable with actors from other languages feeling out of sync with Malayalam but film makers still insisting on them.. I am not sure if Atul Kulkarni dubbed for himself; the reason I didn't mind it as much is because his character *is* an outsider there, so it makes sense that his Malayalam is a bit stilted, and that there is an accent. :) Good to know you are alive, if guilty. That being said, I am a HUGE fan of Prithvi (a gushing fan-girl, really!) and it makes me happy to seem him carving his space in Malayalam cinema. Enjoyed watching his performance in 'Indian Rupee,' such a delightful little movie. Btw, his upcoming 'Ayya' with Rani Mukherjee is making me half-nervous, half-excited. I like the guy too much... Not sure I want to see him in Hindi movies because then he won't be the dashing, handsome Malayali hero I adore, right? Lakshmi, do watch this - the beauty of this film is that there is no excessive violence - what is there, is implied most of the time. There is, I think, one 'fight' scene - and that is on par with what you usually see in other films. Everything else is left to the viewer's interpretation. ps: I really like Prithvi too, but I have no great hopes for his Hindi debut - despite that fact that I also like Rani. Actually, I think this movie was running on one of the BOM TV channels we used to subscribe to. The lingering air of menace was enough to scare me off. Btw, that picture of Prithvi with his face all beaten up doesn't help either... A story of deprivation, exploitation, violence and torture... Phew, I'll pass, good movie or not. :) *grin* The 'deprivation, exploitation, violence and torture...' are all talked about, or implied. They are *not* shown. Yes, Prithviraj walks around with a designer face, but that's a few scenes. The film has more to do with Lal's own conscience and the war between that and what his duty forces him to do. hand on a DVD with English subtitles! original portrayal is presented to be. instincts of the human race. post-independence India have invariably come out well. Bhav Ni Bhavai [ in Gujarati] by Ketan Mehta or Ankur / Manathan / Nishant etc. Ashokji, the DVD (with sub-titles) is available. I do not know where in India you live, but it should be easy enough to source. Or else drop me an email, and I'll see what I can do. Thanks. I have added this in my Must-see list. Isn't that the one with Lal and Shweta Menon? I'd heard good things about it.